All children―regardless of social and economic status, race or ethnicity―should have the best possible shot at reaching their full potential. For children, the possibilities are limitless, but one’s potential is not achieved by accident. Every child needs the opportunities and support systems to reach their goals. Kids born into middle- and upper-income families are likely to have those opportunities and support systems. Children born into poverty are not. If we want poor children to thrive, to become the best people they can be, we must ensure that those opportunities and support systems are there for them too. 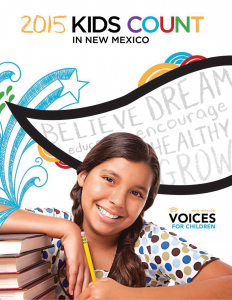 The data in the following pages tell the story of child well-being in New Mexico. For too many children, they tell a tale of struggle. The numbers show us where we stand and where we need to improve, and they serve as a tool and a resource for policy-makers, journalists, and advocates to ensure kids’ voices are heard. 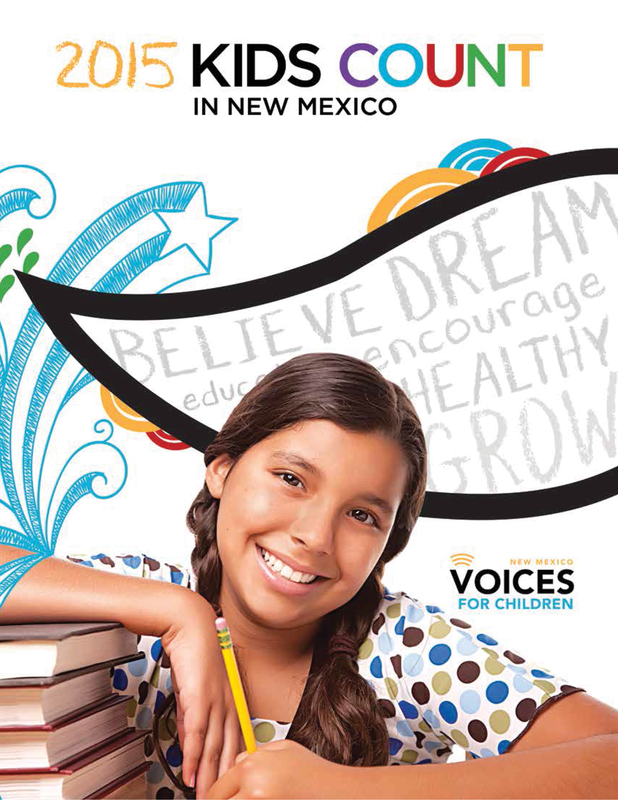 We invite readers to harness the power of data in the fight to improve the status of New Mexico’s kids and families. Each year, the Annie E. Casey Foundation’s national KIDS COUNT program ranks the 50 states in terms of child well-being. States are measured on 16 indicators in four domains: economic well-being, education, health, and family and community. In 1995, New Mexico was ranked 40th among the states for child well-being, the best our state has ever fared. By 2009, we had dropped to 43rd. In 2013, for the first time ever, we were ranked last for child well-being. 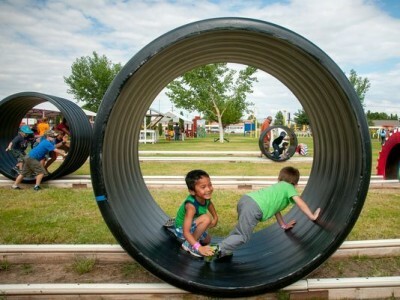 Currently, New Mexico ranks 49th among the states on overall child well-being. This report shines a light on our ranking, indicator by indicator, shows how the data in each area have changed over time, takes a look at how counties, tribal areas, school districts, and racial and ethnic groups fare in the indicators measured, and recommends some proven steps we can take to improve our kids’ and our state’s futures. Too many in New Mexico have become complacent about our state’s poor standings, but enough is enough. We must focus on making improvements. Our kids are not all right, and we can and must do better by them. Our future depends on it—but we must make the necessary investments today. In order to improve child well-being in New Mexico and guarantee our state’s future success, we must make children a priority, champion racial and ethnic equity, and focus on implementing two-generation solutions that simultaneously bolster kids and their families. Too often and for too long, we have treated children as lesser priorities in policy decisions. Many fiscal policies are targeted towards businesses to the detriment of other priorities. When it comes to children, some lawmakers take a wait-and-see attitude, as though childhood can be put on hold until other priorities have been met. But we can no longer afford to wait for good fortune to trickle down to our kids. New Mexico’s children—the state’s future generations—are in crisis now. We must put kids first in all policy decisions. Children’s chances of being healthy, doing well in school, and growing up to be productive and contributing members of society are tied to their experiences in the early years—from before birth up through age five. And in New Mexico, too many young children do not always get enough to eat, go without the kind of early childhood care and education that will put them on the path to success, and are held back by the consequences of living in poverty. Nearly one-third of our children live at or below the poverty level (just $24,250 for a family of four) and New Mexico now has the highest rate of child poverty in the nation. There is an undeniable correlation between poverty and poor outcomes in health and education, and there is no doubt that many aspects of poverty—chronic stress, familial instability, and the lack of economic security, among them—have long-lasting and powerful effects on children, the impacts of which continue into adulthood. By the same measure, growing up in positive, secure environments is linked to improved health and education outcomes, and is key to successful community and economic development. Knowing this, we cannot afford to allow nearly a third of our children to face such adversity and possibly fail to meet their full potential. Their future and ours depend too much upon it. Luckily, we know what works. High-quality early childhood programs like home visiting, child care, and pre-K lead to improved child well-being and are linked to significant long-term improvements for children and savings for states. So first and foremost, we must invest more in high-quality early childhood programs now. Every year that we fail to invest enough money to serve all vulnerable children means more kids who are likely to enter school unprepared to learn. We also need to align these programs with public education, sufficiently fund K-12 education, and support community schools and school-based health centers. We also know that when parents are better educated, their children do better in school and life, so we need to make college affordable and put more adults on career pathways to improve their employability. And in order to ensure that those children with the fewest resources can still pursue their dreams, we need to invest in programs that target improvements towards low-income, and racial and ethnic minority families and children. Laying the foundation for a prosperous future for our state requires us to ensure that we adequately prepare all of our children to become thriving, contributing members of our communities. In order to do this, we have to acknowledge that, too often, children of color may face more hurdles to success, and we must act deliberately to close racial and ethnic equity gaps. No matter where they live in New Mexico, no matter how much their parents earn, and no matter the color of their skin, all of New Mexico’s children should have access to opportunities to succeed. But equality of opportunity is not something that just happens: it is a product of systems, policies, and programs that work together to create an atmosphere and foundation for people to have an equal chance to participate in and strive for success in society. Disparities are also no accident. They come about because of structural forces that erect and maintain persistent, pervasive barriers to opportunities. All across the nation children of color are lagging behind in economic well-being, education, and health outcomes. Racial and ethnic disparities exist in nearly every indicator of child well-being. Children of color are more likely to live in poverty and in high-poverty areas, and are less likely to live in two-parent families than white children. They are more likely to be born at a low birthweight and less likely to have access to high-quality early education. Early health, economic, and learning disadvantages contribute to lower percentages of children of color who are proficient in reading and math, graduate from high school, attend college, and earn advanced degrees. Perhaps nowhere in the United States is racial and ethnic equity an issue of greater importance than in New Mexico where these severe and increasing disparities—especially among children—are particularly worrisome. 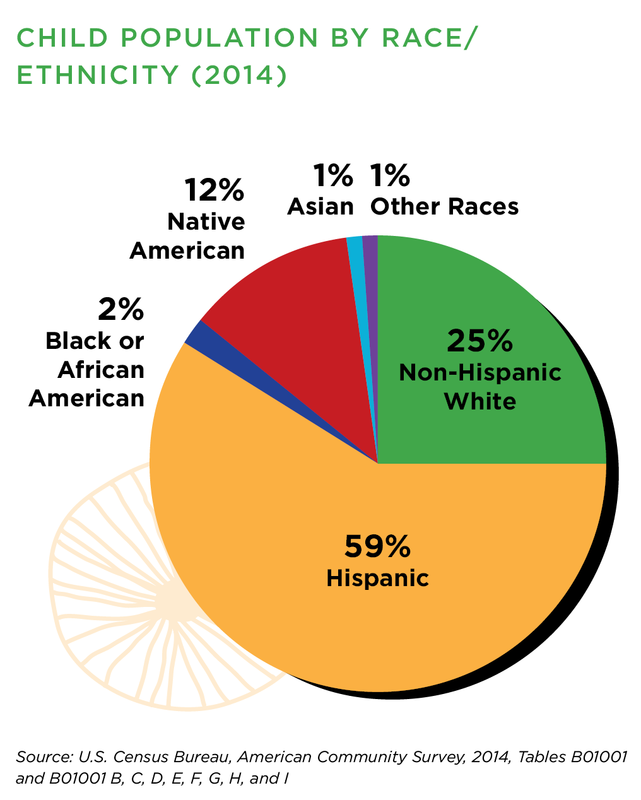 While whites make up the majority population in most states and in the nation overall, New Mexico is a minority-majority state, with just 40 percent of our population identifying as non-Hispanic white. Among children, that demographic reality is even more pronounced: 75 percent of New Mexico’s children are racial or ethnic minorities. With racial and ethnic minorities such a significant proportion of our population, the economic and social price of letting any group fall behind is high and—as demographics become increasingly more diverse—will only continue to grow. In order to better understand and address racial and ethnic inequity, we need to collect and analyze data along racial and ethnic lines and use it to inform policies and decision making. In order to see the greatest positive impact on children of color, we need direct policy solutions and investments towards communities, areas, or districts with high percentages of children of color. In order to ensure we’re receiving the greatest return on our investments, we must implement and continue to invest in proven, evidence-based programs that are inclusive of and focused on improving outcomes for children of color. Parents are also plagued by the disparities that run along racial and ethnic lines. Research shows that a child’s well-being is strongly tied to his or her family’s stability and resources, and so in addition to championing policies that are best for New Mexico’s kids, policy-makers should also promote strategies that increase the strength of New Mexico parents and families. Any programs that seek to improve child outcomes should be coordinated with services that address the needs of parents. What’s known as a “two-generation approach” is critical. Though life can be hectic for all families, low-income families often tread a precarious line between stability and financial crisis. A sick child can mean lost work and wages for low-income parents. Living in substandard housing or high-poverty neighborhoods can put the health and safety of them and their children at risk. High-quality early care is generally out of the question on their limited wages, and this cost, plus their often chaotic work schedule, means their children may bounce between family, friends and unlicensed care centers. A job loss or a major expense like a car repair can drive them into homelessness. Low-income families of color face additional structural barriers, such as lower wages, fewer job opportunities, higher interest rates, and more. The state’s high poverty rate—over 21 percent—is one of New Mexico’s most challenging problems. While most other states have recovered from the recession, New Mexico’s economic recovery has flat-lined. Just as our state cannot thrive when so many of our families are struggling economically, children cannot thrive when they face stressors and adverse experiences that negatively affect their brain development, long-term health, and socio-emotional well-being. However, there are common-sense solutions to our economic problems and to the crisis that our kids and families are facing. To be most effective, these solutions should include a deliberate and coordinated two-generational approach. The state’s child care assistance program is one that would benefit from such an approach. It was created as a work support for parents, so little emphasis was put on ensuring that children receive the highest-quality experience possible, which would help prepare them for success in school. Greatly increasing the quality of care—which would require greater funding—would result in a program that had much broader benefits not just for the families it serves but for the state as a whole. Other income, wage, and work-support programs help provide practical pathways out of poverty for entire families. Tax credits for low-income parents such as the Earned Income Tax Credit and New Mexico’s Working Families Tax Credit boost the incomes of working families, helping them afford basic necessities as well as large expenses such as job training programs or a car repair. These credits are proven programs that reward work and lift tens of thousands of New Mexico kids and families out of poverty each year. Career pathways, job training, and apprenticeship programs also support families by helping parents develop the tools and skills they need to succeed. In turn, better-educated parents tend to raise better-educated children. Paid family, maternity, and sick leave options for workers as well as family-friendly scheduling help working parents take care of children in times of need without the threat of losing employment and a secure source of income for their families. Home visiting services model healthy parenting practices and help connect families with community resources—benefiting both the parents and the children in the families that receive these services. 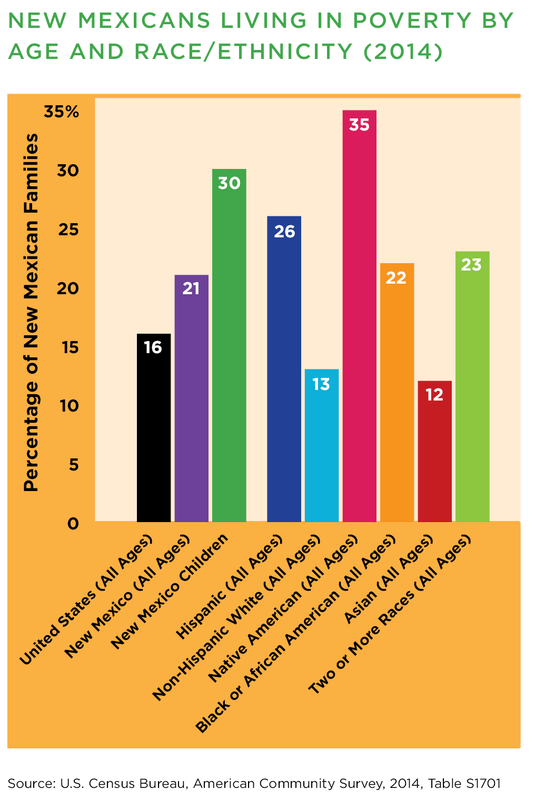 In the data pages for this report, you’ll find more information on how New Mexico’s children and families fare in the 16 KIDS COUNT indicators. In tracking outcomes, we show differences across races, ethnicities, and counties, note some encouraging signs as well as outcomes that continue to be discouraging, and outline some proven policy steps that can lead to improvements. All children should have access to the opportunities and resources they need to reach their full potential. By investing in New Mexico kids and families, we can make our communities, our economy, and our state stronger. We’re all in this together, and investing in New Mexico kids is not just the right and the moral thing to do—it is also the smartest course of action to guarantee our state’s future success.